Can someone pinch me please? Is it February already? Where did January go? 2016 has started on such a busy note for me. As usual things were super crazy on most of the days and in the little free time I got, all I wanted to do was slouch in my couch and read books of all kinds - a simple and uncomplicated way to relax. But, honestly a corner of my heart was also longing to sit up, write a few words and publish a blogpost. So, before that feeling of enthusiasm goes away; before am swayed into the monotony of everyday activities that constantly need my attention, here I am sitting in a coffee shop, enjoying a cup of coffee with warm blueberry scone on the side and typing this super quick and easy black eyed pea curry recipe for you all. 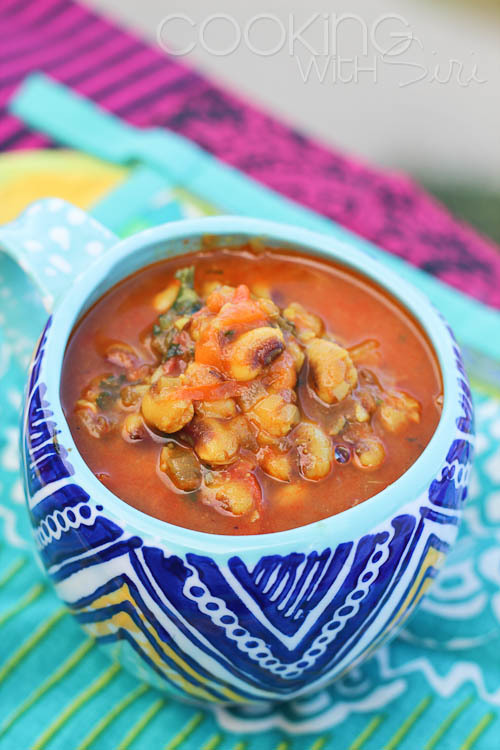 I make this dish often, on a weekly basis and sometimes substitute with other kinds of beans such as pinto, black bean, red beans and even chickpeas. Either way, it serves as a healthy side dish to a bowl of rice or for a bread/roti. Enjoy! I recently started batch cooking my meals for the upcoming week on Saturdays. It simply amazing how much time and effort it saves during those crazy, lazy, busy weeknights. It is important to note that not all recipes stay well for 4-5 days. I am currently in the experimental stage on what recipes work and which ones don't. Once I have a good list of recipe ideas, I will share my batch cooking experiences with you all. Today's recipe I must point out is perfect as a make ahead curry as it doesn't contain any diary. Make it on the weekend andJust serve some in a bowl, reheat and serve as a side dish with rice or roti during the weekdays. 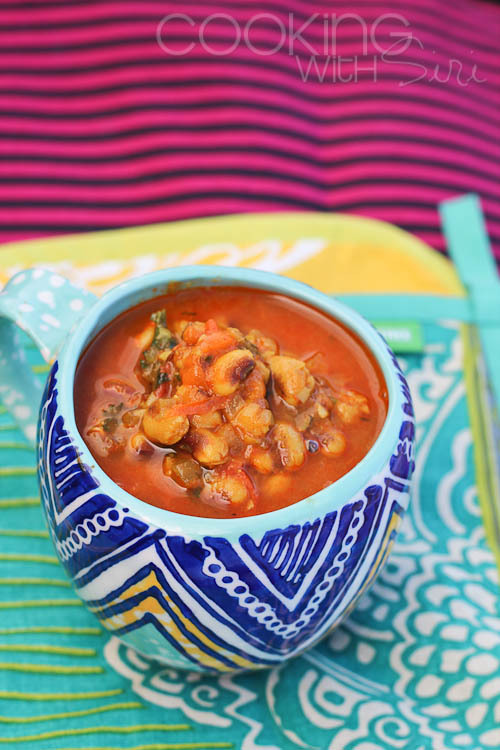 I used frozen, cooked black eyed peas for this recipe. 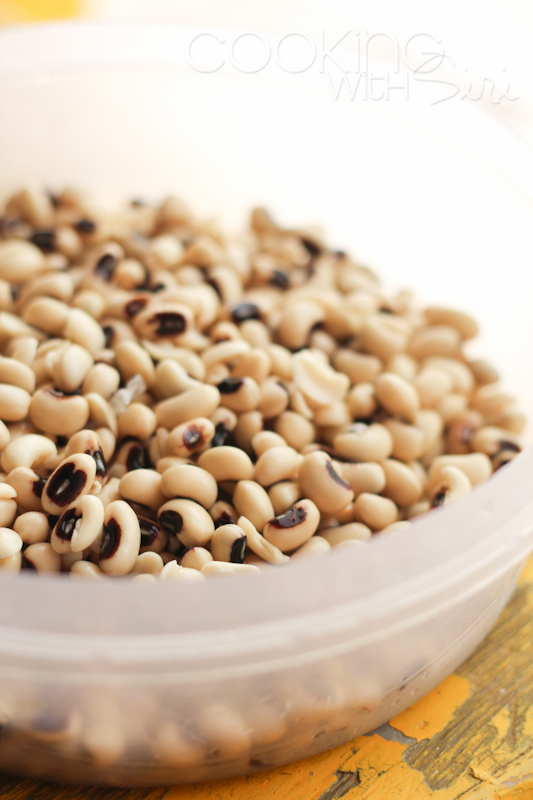 You can easily substitute with rinsed, canned beans or dried ones. To prepare the dried beans, wash and soak then for few hours in filtered water and pressure cooker with a tea bag (for that lovely color and trust me, there will be no after taste) until 4-5 whistles. 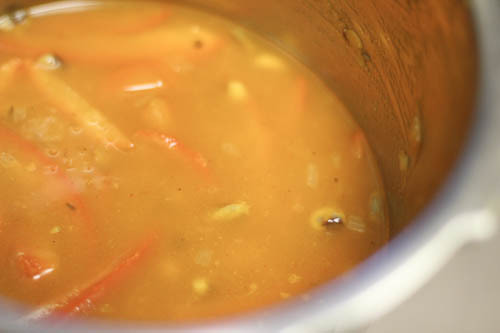 Use the cooked beans and the water for high nutrition content. 1. In a pressure cooker, add oil/ghee. 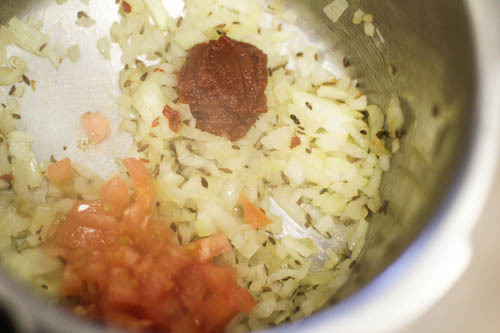 Once it is hot, add cumin seeds and as they start to crackle, add chopped onions. Cook for a 3-4 minutes on medium heat till they are pink and translucent. Then add green chilli (if using) and ginger-garlic paste. Give it a good mix and cook for 2 minutes. Add tomato paste and tomato pieces. Again, mix and cook for 4-5 minutes until the tomatoes are mushy. 2. 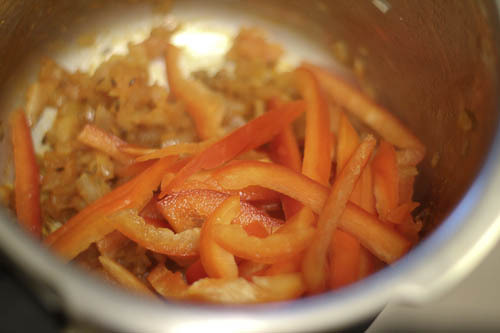 Add red pepper pieces. 3. 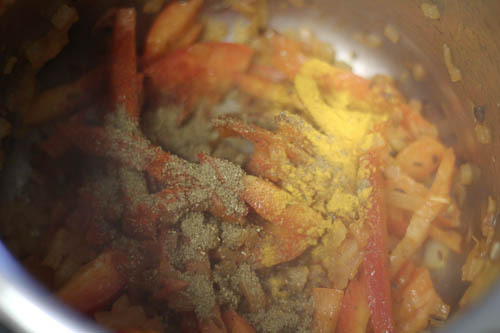 Then add spices - turmeric, salt, chilli powder, coriander powder and garam masala. Mix everything well. 4. Finally add the frozen black eyed peas. 5. Then 2 cups of water. I love my curry to be of soupy consistency. Reduce it to 1 cup if you want it a thicker consistency. Adjust seasoning and pressure cook for 3 whistles. Depending of how big or small your cooker is, you might have to increase or decrease the amount of cooking. Mine is a 5 litr cooker so it gets done in 3 whistles. Let the pressure release naturally, give it a good mix and garnish with fresh coriander. Add lemon juice just before serving. Tastes really good with both rice and roti. Love the red color of the curry. 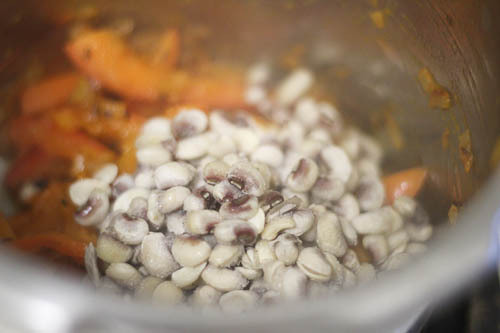 I don't make curry very often with black eyed peas but did cook couple of curries for the blog. Loved it and am sure even this version is as delicious as it looks. Siri, do they take donations for used but good salwars frocks etc? Vaidehi Ashram doesn't take any used clothes. I tried to donate some but they politely declined. Thanks!